18-22 September 2017 Purpose, Values & Culture How Does It Drive Governance? 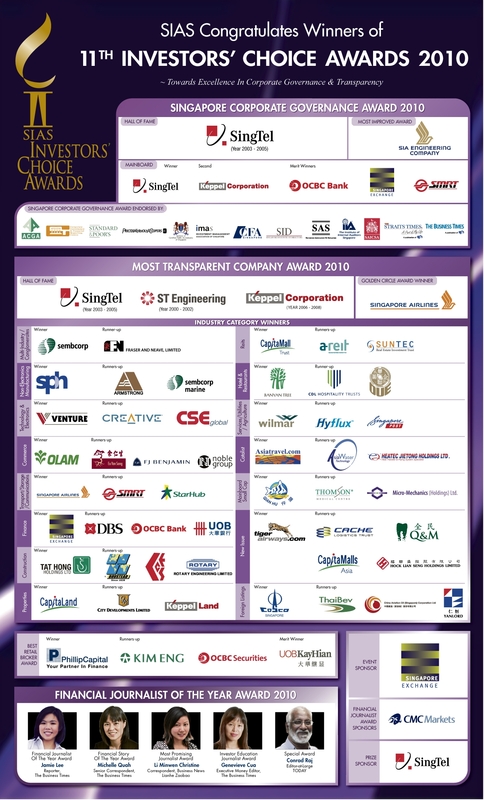 All scorecards in the selection process are jointly developed by SIAS with the Centre for Governance, Institutions and Organisations (CGIO) of NUS Business School to recognise listed companies that have excellent corporate governance practices and shareholder interests. All SGX listed companies are assessed using the SCGA Scorecard. The SCGA Scorecard framework rates companies based on five areas: STARS - Shareholders' rights and equitable treatment, Transparency and disclosure, Accountability and audit, Responsibilities of the board and Stakeholders' roles. It includes emphasis on shareholders' rights and updated coverage of stakeholder engagement from the G20/OECD Principles of Corporate Governance. The top 20 % of the companies in each category are further assessed incorporating the Thomson Reuters StockReports+ scores. The scores are incorporated to assist investors to choose not only well-governed companies but also, financially well performing companies for investment. The StockReports+ scores comprised of analyst ratings of earnings, fundamentals, relative valuations, risks, price momentum and insider trading. The top 10% of companies are further assessed against the Diversity Scorecard based on gender diversity, board independence, directors' breadth of experience and skill sets, and board diversity policy. REITs and Business Trusts (BTs) are assessed using the SCGA REITs and BTs Framework based on Responsibilities and Structure, Interested Party Transactions (IPTs), Distribution and Valuation, Gearing and Credit and Emolument & Performance. The top 20 % of companies are further assessed incorporating the Thomson Reuters StockReports+ scores. The shortlisted companies will be reviewed based on qualitative and quantitative inputs with the SCGA Selection Committee Members. Companies with the highest scores may not necessary clinch the awards. To encourage SGX-listed SMEs to be more transparent so as to help investors make informed decisions. Companies are first evaluated and shortlisted using the scorecard developed for SIAS by CGIO of NUS Business School which includes an emphasis on shareholders' rights and updated coverage of stakeholder engagement from the G20/OECD Principles of Corporate Governance. Companies are assessed on transparency and disclosures in key areas such as related party transactions, timely financial reports, directorships held in other companies. The selection process also takes into consideration the "Disclosure and Transparency" aspect based on publicly available information and the company's performance. 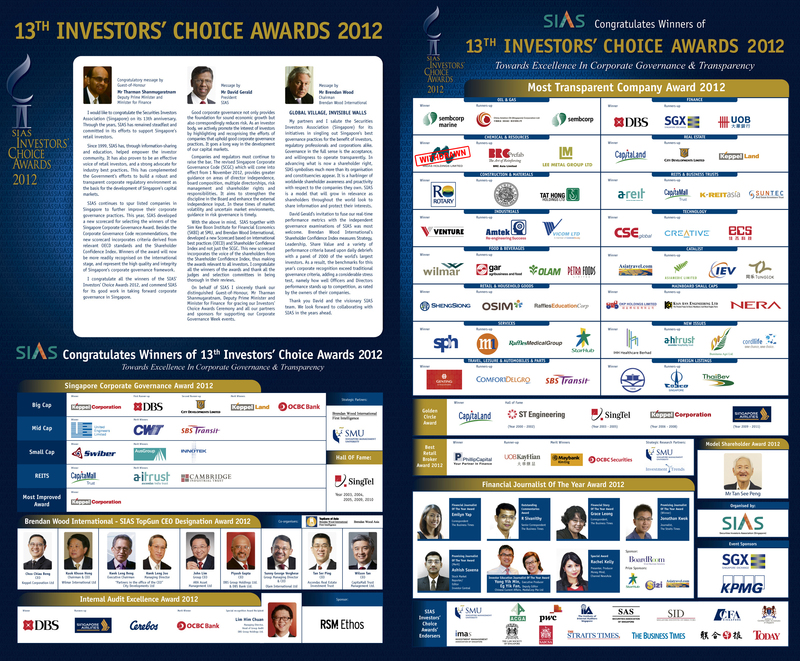 The scorecard for the selection process is jointly developed by SIAS with the Centre for Governance, Institutions and Organisations (CGIO) of NUS Business School, to recognise listed companies that practice good investor relations. All SGX listed companies are evaluated based on ‘Shareholders' Rights and Equitable Treatment' and ‘Transparency and Disclosure' Sections of the STARS framework. The top 20% of companies with the highest scores are then assessed further using the Shareholder Communications Excellence Assessment Scorecard (Stage 2). The Company's communication activities such as Investors Day, Dialogue sessions and briefings are included as part of the overall score. The shortlisted companies will be reviewed based on qualitative and quantitative inputs with the SCEA Selection Committee Members. The Sustainability Award (SA) is a new award jointly presented by SIAS and CGIO to recognise companies with substantial Sustainability Reporting report and practices. Companies are assessed using the Sustainability Score Framework and the top 20% of companies are further assessed incorporating Thomson Reuters StockReports+ scores. 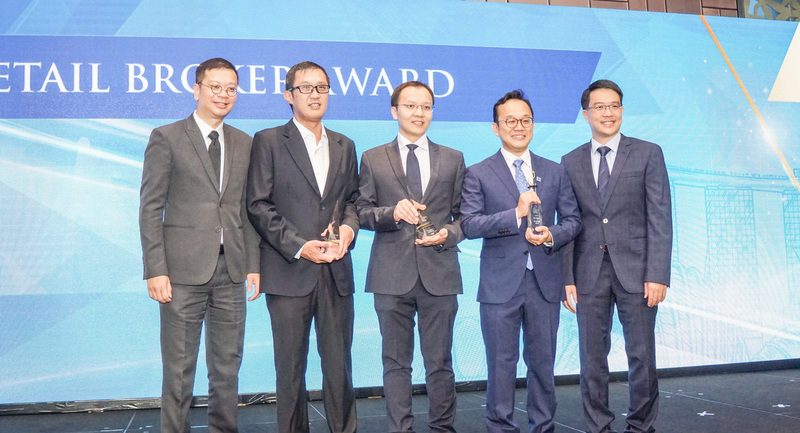 All shortlisted companies for the various awards are further subjected to another round of evaluation where feedback from retail investors, funds and high net worth investors are also taken into account. To encourage brokerage firms to better their quality of service and information provided to ensure retail investors have a good understanding of what they invest in. SIAS, in collaboration with Singapore Management University and Investment Trends have developed a set of criteria for the effective evaluation of brokerage firms in Singapore. 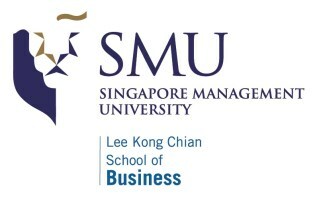 Stage 1 – Through qualitative research, SMU identifies brokerage firms based on variables that are, inter alia, range of products, accounts and market covered, trading cost, trading platforms and modes, customer education and service, including handling of complaints, number of security measures and quality of mobile applications. Stage 2 – Through quantitative research, Investment Trends, a global financial services market research organisation incorporates their research findings into the survey on the brokers, based on variables such as, customer education and services, advisory services / remisiers, provision of company research, charting, choice of investments, trading ideas & strategies, functionality, speed and reliability of website and mobile app platform, and rewards loyalty programme. Stage 3 – Based on both qualitative and quantitative research, results are tabulated and scored. Final Stage – Selection Committee Members meet to decide the winners based on the tabulated results. 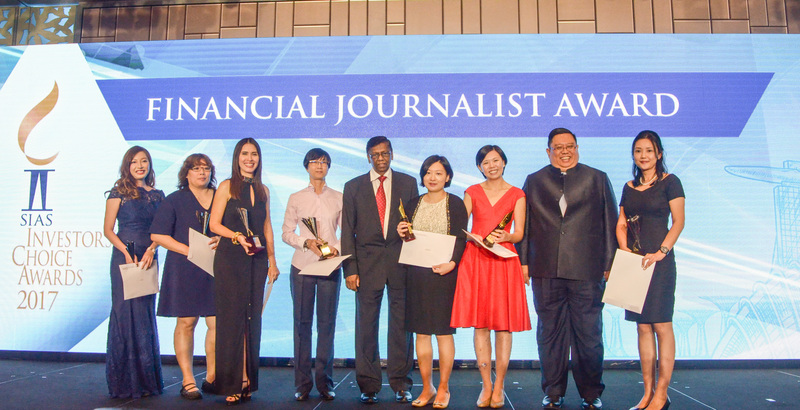 To encourage financial journalists to uplift their reporting standards and provide information that will be beneficial to the investing community at large. Judging of entries is based on news value, originality, reportorial quality, analytical value and impact in the financial community and to the retail investors at large. This award is opened only to career journalists. Journalist from the local media, both print and broadcast, are eligible. Based on news worthy contributions that had made a substantial impact on the investing community in the period under review, he/she has to be a well-rounded journalist with the ability not only to break significant stories but is also able to write commentaries that take a clear position and provide insights for investors. Focusing on education and the impact on the investing community, the journalist must have displayed sound knowledge of the investment principles and the instruments discussed and written consistently over a minimum period of at least six (6) months. To qualify for this award, a candidate has to be a financial journalist for not more than three years and under the age of 30. To encourage continuity and raise the level of community education to higher standards by awarding the mainstream media, registered with IMDA.